So I have to ask the question. Is Matakevich actually getting a shot @ the starting ILB position vs. Bostic or is this just more of "he's a backup but we're giving him the obligatory shot so he'll push himself"? I'm just wondering. 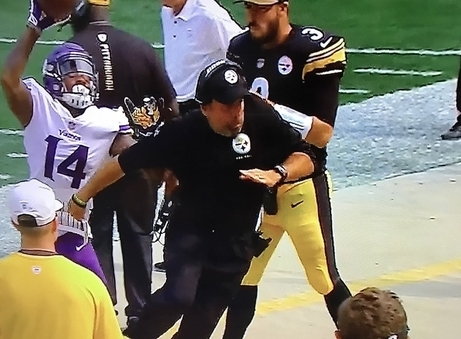 Steelers always give their vets a shot with the first team before they lose their job. Sends a message to veterans and new players alike -- everyone has to earn their spot. Unfortunately, the Great Red Hope is not a starting caliber NFL player. Yeah this is where I am with it. He can be a spot starter. I was serious in my earlier comment. I think it has shaken out so far that Bostic & VW will be the likely starters, Thomas is really coming on at Mack. Wouldn't surprise me to eventually see Bostic as the starter in run situations and Thomas doing some platooning in passing situations/2 min drill. Sounds like Bostic is separating himself from Matakevich. He will start opposite Vince. I think ILB is like FB. Has its uses but the package sets are pushing it off the field. This also explains nicely why they were in no rush to daft an ilb. Oh so effectively I think they want Edmunds to be that hybrid guy that Shaz was. Bostic has been the starter this week. If you read any of the Depot reports by Alex over there while he is at training camp, it isn't going to well for Dirty Red in coverage. Even Jesse James is burning Red in the passing game. The thing about Bostic is that many are under rating his speed and athletic ability. When he came out he ran a 4.61 40 at the combine and he just managed to crack the 7.0 3 cone time, he had 6.99. To put that 3 cone time into perspective, I believe Morgan Burnett as a safety ran a 6.87 and Jaylin Samuels as a RB ran a 6.93. Bostic is just head and shoulders better in terms of speed and athletic ability than Williams or Diry Red, yes, he is not a Shazier but he is closer than anybody else that we have discounting Matthew Thomas who has to prove he knows how to play. If you were able to merge Bostic's knowledge and instincts with Thomas's athletic ability you may have the equivalent of Shazier. Matakevich made a couple of good plays in coverage today. 6. Stevan Ridley runs a wheel down the left sideline. Tyler Matakevich good coverage to his inside hip. Throw over both their heads. 16. Matakevich matches Ridley on an out route. Breaks up the throw. 6. Nice play here from Tevin Jones. Dobbs fires to him. Jones makes a slick catch over fully over his head and hauls it in against Sutton and Matakevich.